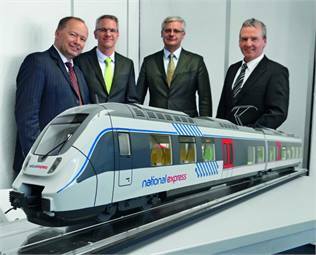 (From left) Tobias Richter, managing director, National Express Rail GmbH; Volker Kregelin, VP, business development, Bombardier Transportation; Norbert Hübner, sales manager, Bombardier Transportation; Wolfgang Schuster, GM, National Express Rail GmbH. Bombardier Transportation won an order from National Express Rail GmbH, a German subsidiary of the British National Express Group (NX), to supply 35 Bombardier Talent 2 EMUs for regional service. A consortium of National Express and IntEgro Verkehr won the license in a Europe-wide tender to operate services on the lines RE 7 "Rhein-Münsterland-Express" and RB 48 "Rhein-Wupper-Bahn." The order is valued at approximately $221 million plus spare parts. Bombardier will supply three-car and five-car Talent 2 trains with a comfortable interior design. The modern vehicles set a high standard in ecological sustainability, which is proved by a certified product declaration according to the European system EMAS (Eco Management and Audit Scheme). Almost all the materials used can be recycled, thereby optimizing energy and resource efficiency. The aerodynamic electric trains feature many doors with improved access for people with restricted mobility. The motor cars include a separate driver's door. The air-conditioned Talent 2 trains offer ample and comfortable seating in the first and second class sections while multi-purpose areas provide space for prams, wheelchairs and bicycles. Other interior features include passenger information monitors showing details on connecting trains, video monitoring as well as large, disabled-friendly toilets and an extra standard toilet in the five-car vehicles. National Express will operate the trains, equipped with an automatic coupling at every front end, predominantly in multiple traction. Bombardier will deliver the trains in 2015. RELATED ARTICLE: Check out, "SunRail Service to Transform Florida's Commuter Culture."